Mint springs with pieces of dark chocolate were served in tea houses and dinner halls in the early 1900s. This treat was served for patrons after desserts to chew for good breath and aid digestion. Soon enough thin layered mint and chocolate candies appeared in many forms. What we know today as a classic version of thin mint with dark chocolate was introduced in 1962 by Rowntree. 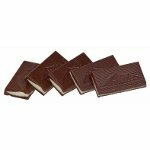 They were called After Eights and considered at that time as a perfect after dinner mint. Since 1988 these mint chocolates were produced by Nestlé. Did you know that Andes Chocolate Mints have nothing to do with the Andes mountains? Its original name is Andy's Candies, but the owner found, that men don't like buying candies with another man's name to their wives and girlfriends, that is why the name was changed. Chocolate mint is not only a candy. It is also a herb, cultivated in gardens. This herb is a part of spearmint family, it has edible leaves that taste like chocolate and mint. By the way, this mint will remind you flavor of Andes Chocolate Mints.